Description : This plugin installs additional options on the search bars in your Forumotion forum. Allowing you to choose between posts, topics, and tags. 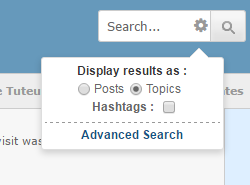 There's also a link to the search page for more advanced searches. Demo : Click the cog in the search bar in the top right of the page. If you do not see the cog click here to refresh the demo.